Whoops, forgot to start this on Mon! Last edited by Cheryl; Feb 18 2010 at 03:17 PM. 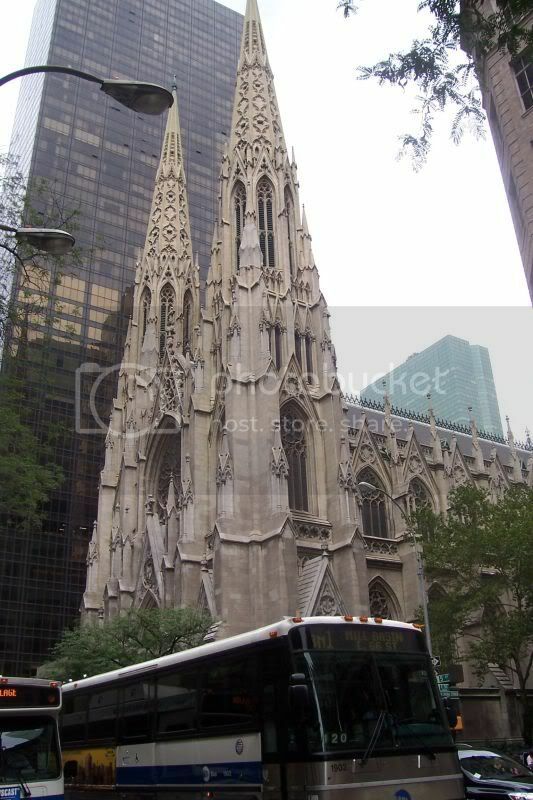 St. Patrick's Cathedral in NYC July 2008. Lichfield Cathedral: the Choir from the medieval balcony outside the Chapel of St Chad's Head looking across to the pedilavium which leads to the Chapter House. 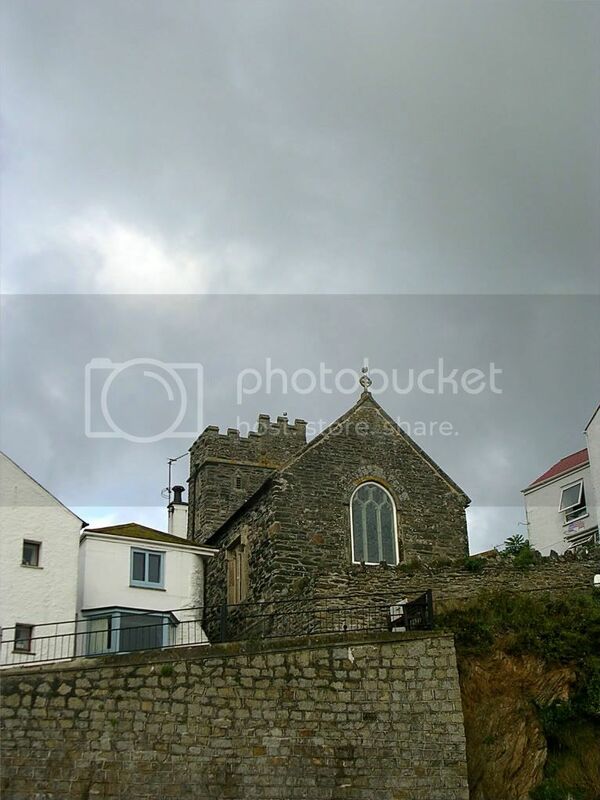 Except that this church is in a coastal village in southern Cornwall, I can't remember where it is. Last edited by P'ter; Feb 22 2010 at 04:19 PM. St. Mary's Cathedral in Ambleside, UK. I love the variety of cross designs on the roof. Interior of the Cathedral of the Immaculate Conception in Denver, Colorado, US. Geez, I have litterally hundreds of photographs to chose from for this subject! 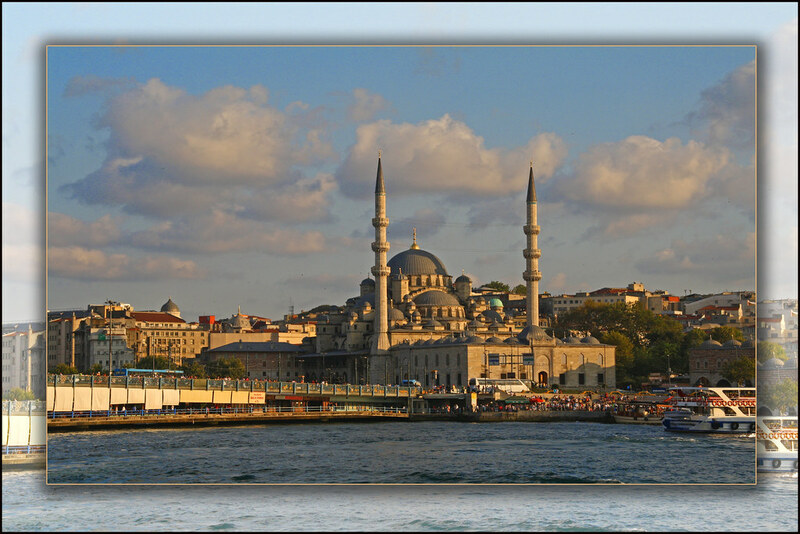 I have picked a new and an old photograph with two different buildings, two different religions. First: the relatively new picture of the Yeni Cami, new mosque at the Asian end of the Galata bridge in Istanbul, shot in September last year when we traveled that country. Shot in the beginning of the golden light at half past five, which gives the photo somewhat of a painting like feel. The second shot is older by over a quarter century while the subect itself is much, much older and has celebrated its 750th birthday already. 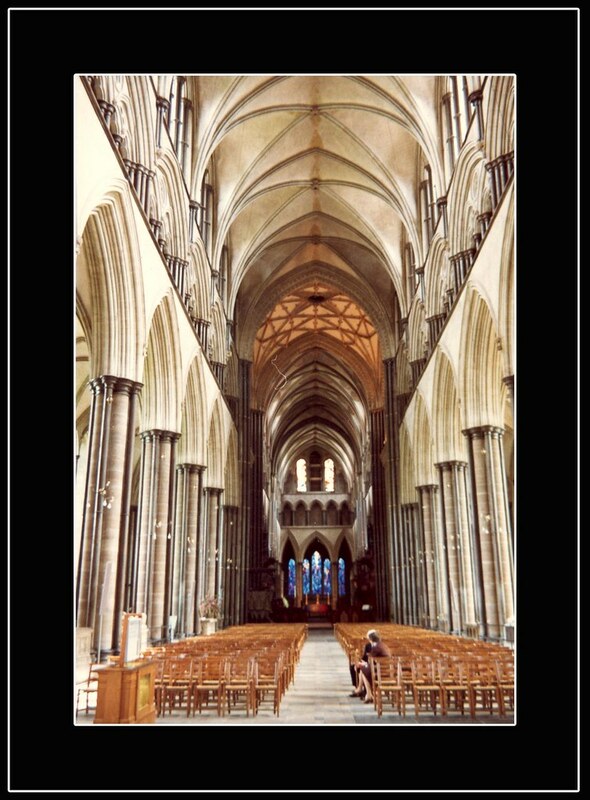 It is een interior shot of Salisbury Cathedral in Wiltshire, UK. Shot with an Olympus analog OM1 camera when my wife and I were backpaking the UK in 1983. This is, of course a scan and I must find the negative for these old photos because I am not altogether happy with the quality. It does relay the atmosphere though. The second picture only shows a small fraction of the inside - practically every wall is covered in statues and paintings. A really impressive place in the middle of nowhere. Since we're into the second week: Steve, I lurv the electric fan. You'd think they would at least have had it guilded! Kat, that's a fantastic looking cathedral in NYC. It's a pity about the buses in the foreground, but I guess they're difficult to avoid in a busy city. 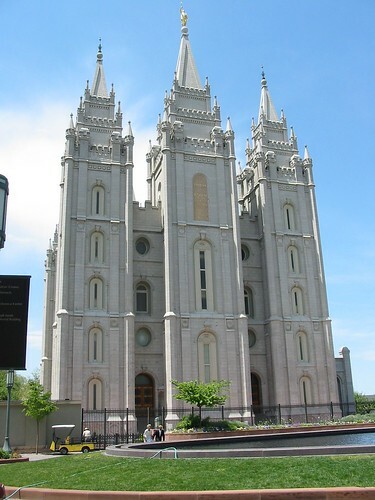 P'ter, what are the names of your churches? I like the consecutive gothic arches in your first picture. Both pictures could perhaps be improved by cropping - taking out some of the dark shadow at the bottom of the first picture and some of the grey sky at the top of the second. Jube, an interesting take on the idea. 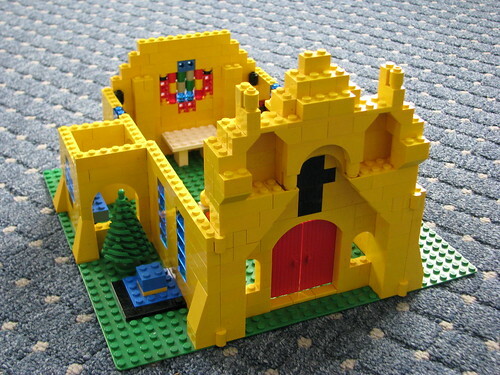 A non-church religious edifice. Blondmom, what a great contrast, and your lego model looks a little bit like Pam's first picture too. Pam, your second picture is great. The building has a presence and contrasts really well with the greenery in the foreground. I think your first picture would be better if the statue wasn't there. I don't know why - maybe he's competing for attention? Hans, your picture of the Yeni Cami is an absolute stunner. I can't fault it, although I'm not sure about the picture on picture framing - a matter of taste I guess. Your second picture looks good too. Just like Cheryl, you have both the interior and the stained glass windows looking good. I hope you can make a sharper image from the negative. I love churches and try to find them everywhere I go. St. Patrick's is lovely and the photo is also lovely despite the bus. I happened to be there when there was a line wrapped around the church. I couldn't imagine what all those people were doing standing in line to go inside a church. Then I realized it was Ash Wednesday and everyone was waiting to get ashes. We skipped the ashes and found another entrance so we could go inside. P'ter I love your interior of Litchfield Cathedral. The "coats of arms" struck me as being very unique. Jube, I have found that the occasions when I've been able to go to Mass outside (usually at camp) have all been very special so I totally agree with your statement about enjoying the service outdoors. Steven, I am definitely going to have to go to Tucson to see that absolutely stunning example of spanish mission. Blondmum: the coats of arms are those of the various canons. Most cathedrals are wide enough that the canons sit in the third row behind the lay clerks (Altos, Tenors & Basses). 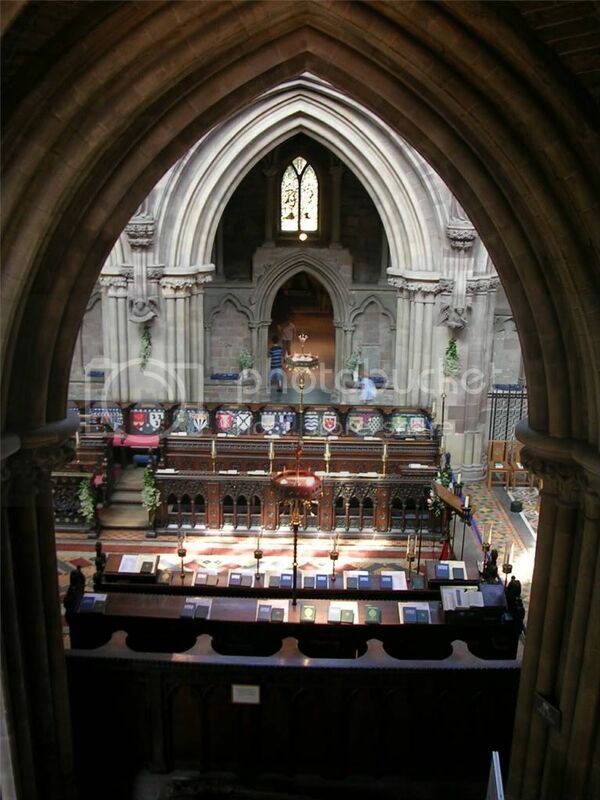 Lichfield is rather narrow so there are only two rows of stalls and the lay clerks get the bearings. P'ter, I didn't notice the coats of arms when I first saw your pictures (too busy looking at the archways). They're impressive. Tell me you edited in the labels with the names of the churches and I didn't overlook that as well. Blondmom, it's best to visit Mission San Xavier on a weekday morning. There's less chance of it being closed for a service, and the light is better in the morning. The scafolding has been there for years, but is gradually reducing. The left tower was completely covered in 2005 for our first visit. This picture shows what it was like in 2008. Maybe it will be gone this year - catch it before they start on the other tower. By the way, did you notice the right hand tower is not finished? The builders ran out of money. I like Blondmom's choices and adore the lego mission. I love Pam's photo because of the atmosphere it breathes, the lighing is fabulous. Chery, the pristine white inside fits the immaculate conception so well... and is very impressive, too. and Steven, that interior is so intricate it reminds me of the birth facade of Gaudi's Sagrada Familia of which I almost posted a picture. Unfortunately there's a two picture limit Great photograph! What/which wide angle and/or fisheye lens do you use? There's nothing to stop you posting your other picture in the main Exhibit Hall, Hans. Amazingly, that's only a small part of the interior of San Xavier. What I posted was a cropped portion of a 10.5mm fish-eye picture. There are two other altars just as intricate as the one shown. You're missing San Xavier's lions, Steven! LOL Did you know San Xavier was used in the late 60s/early 70s for the exterior shots of the Rancho Montoria on the television show "The High Chaparral"? High Chaperal! We always watched that. Manolito That and Bonanza were the big US western series that were big in my country. Actually after I took the photo of an outdoor service, at the local market, my immediate thoughts were of Jesus Christ preaching in the great outdoors and sweeping up all the stalls because they were working on the Sabbath. 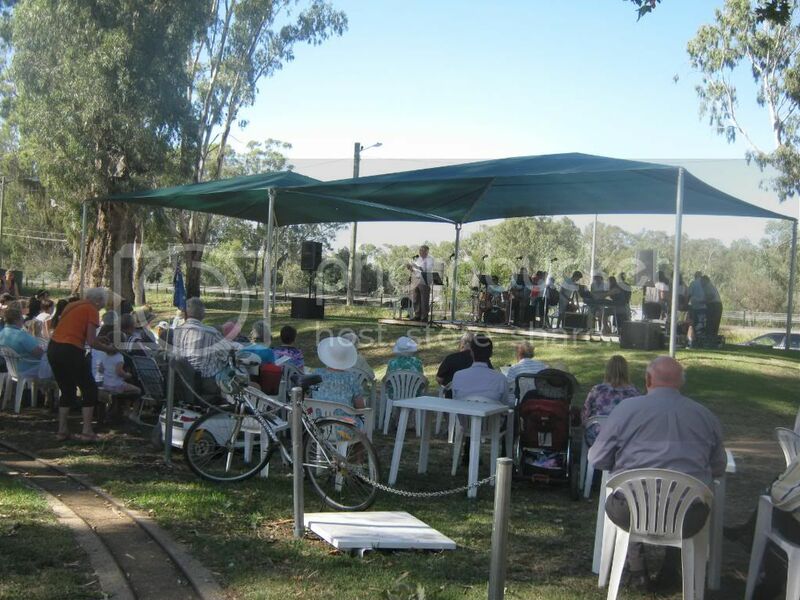 Then again, I prefer an outdoor church service to an indoor one - I fidget too much in the indoor version At least the outdoor version gives me a chance to ponder on the great spirit's work, in some respects better then an indoor service usually does. That's just my thoughts on the subject and I'll leave it at that.